Another year has come and gone and I notice (with some embarrassment) that it has been well over 12 months since my last post. While I could hold this up as a testament to how busy I've been, the truth is that I'm just a lousy blogger and cannot dislodge the feeling that no one could possibly find anything about me or what I do the least bit interesting...at least not interesting enough to actually read an entire post. Yet still, I'm compelled to share so here we are. 2015 has, in fact, been an extremely busy year for me. I have moved on to post-graduate study at UniSA and am working towards a Masters Degree in Visual Art and Creative Practice. At the same time, I've been completing the illustrations for my first children's picture book, which will be published by Scholastic later this year. I've also signed a contract for a second book (with the same publisher) and am working on preliminary character development and storyboards. 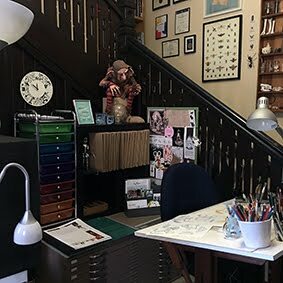 There have also been a number of small side projects and, while I can't share picture book images quite yet, I hope to post some of these self-initiated projects here in the coming months. 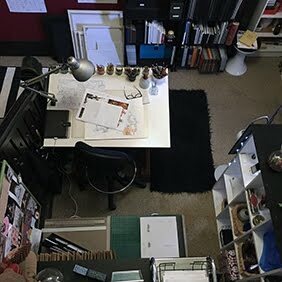 The post-graduate program that I'm currently undertaking provides dedicated, individual studio space to its students, but unfortunately at the end of 2015, the decision was made to re-purpose that space and so we were requested to pack up and move out. 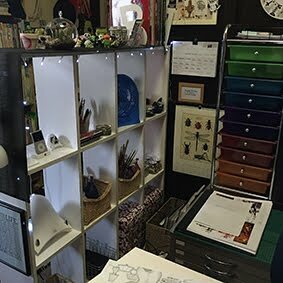 Although not the end of the world, the timing (a week before Christmas) plus the fact that I had moved all of my studio paraphernalia into this space, caused enormous upheaval at home and seriously compromised what is already a very tight work schedule. As always, my husband was my saviour, and with the help of my son we spent New Year's Eve transporting a trailer-load of furniture, artwork and materials from Adelaide back home to Strathalbyn. 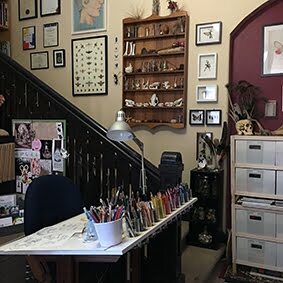 I am so very fortunate to have a space that I can go back to and set up as my own. While I hadn't intended to work from home again, now that the dust has settled, I couldn't be happier. I certainly won't miss the almost 4 hours of travel every day (I don't drive, so take public transport which involves two buses from my town to the city) and as I still need to attend a lecture every now and then, I'll still get my city fix. One of the positives in all of this is that I was forced to re-organise and weed out a lot of old, useless and pointless stuff. 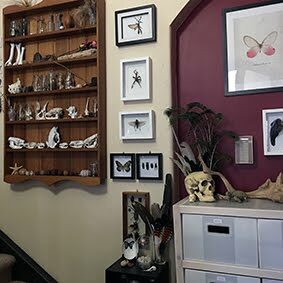 Those of you who know me well know that 'minimalism' is not a term I relate to in any way, but I do have to have things orderly, clean and tidy. 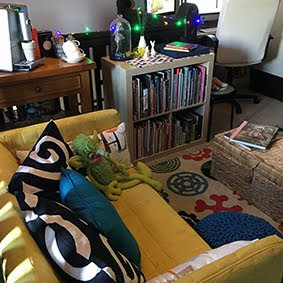 A chaotic brain plus a chaotic space would drive me to gibbering incoherently under my desk, and although I've been close at times, I'm not ready to go there quite yet. Anyway, here are some photos of the new old space. It's very tiny, but very practical and inspiring to me. I'm looking forward to sharing what comes out of here in 2016. Desk, work & paper files, with Goblin presiding. Looking up to the 'museum wall' leading to the first stair landing. 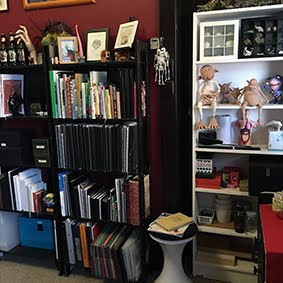 Books, files, sketchbooks and half-finished sculptures. Work station housing materials and the ever essential i-pod. I love them, but haven't been able to find any new ones in ages. 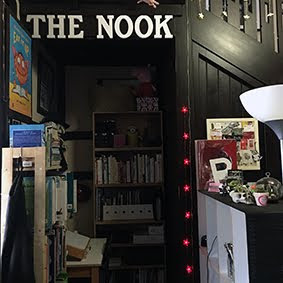 'The Nook' is the tiny room that is the entrance to our under-stairs storage area. spot for my light table. It's lovely and dim. and other beautiful natural objects. Looking down from the first stair landing. 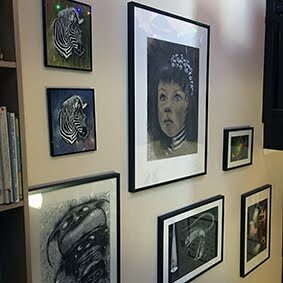 Some of my work on the wall leading up to the second landing. 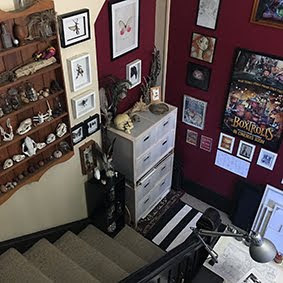 Looking down into my studio from the second stair landing. he was made by 'Spooky Daddy', a very talented US artist. 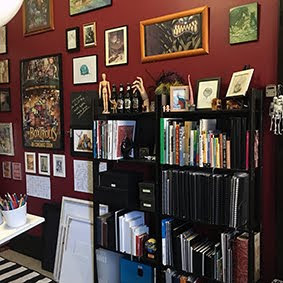 Your studio is totally gorgeous, and I'm so glad to be able to observe the eye candy of your creativity again. Please don't ever stop making your marvellous wonders!